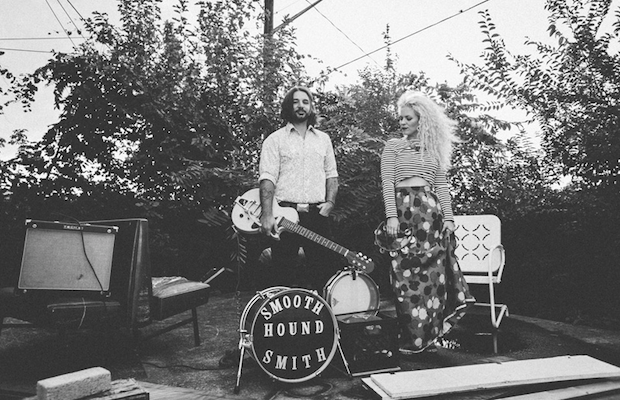 Foot-stompin’ folk rockers Smooth Hound Smith are about to release their latest full-length effort, Sweet Tennessee Honey, this Friday, and we are excited to give you an exclusive sneak peak at their highly-anticipated new project a little early! Zack Smith and Caitlyn Doyle have been crafting their own mixture of blues, bluegrass, rock, funk, and folk for years. The duo chose to collaborate with many of their talented friends on their inspired second album, including Natalie Maines of the Dixie Chicks, Sarah Jarosz, Jano Rix of the Wood Brothers, Noam Pikelny of the Punch Brothers, and Todd Phillips of the David Grisman Quintet. After a year of relentless touring, including stops at Bonnaroo and Live on the Green, the duo will celebrate their new record with an album release party at Exit/In on Jan. 15. Local favorites Daphne & the Mystery Machines and Carl Anderson are also set to join the party as support. Tickets are still available for only $10, so grab them before they’re gone. If you can’t wait until Friday to dig into Smooth Hound Smith’s latest offering, click below to hear an exclusive stream of Sweet Tennessee Honey in its entirety.